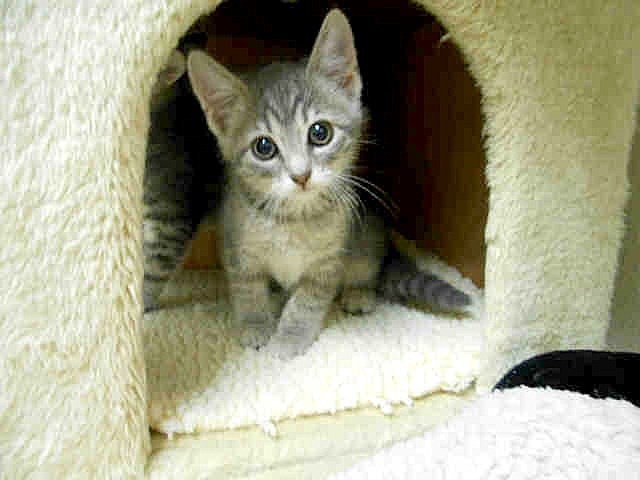 Betsy is a gray tabby domestic shorthair. She is two months old and has been spayed. She arrived at the shelter on June 25. Shelter staff said the following about her. “Betsy is a charming and cute kitten who will be a loving, loyal companion to your family. She regales in a stunning gray and marbled white tabby coat, and she is easy-going and social with other animals.” Her ID number is A063832. Dutch is a neutered male, tricolor Chinese Sharpei mix. The shelter thinks he is about three years old. He has been at the shelter since July 12. Shelter staff said the following about Dutch. “No, Dutch didn’t get stung by a bee! That is his fascinating mix of Sharpei and hound coming out in his generous muzzle. 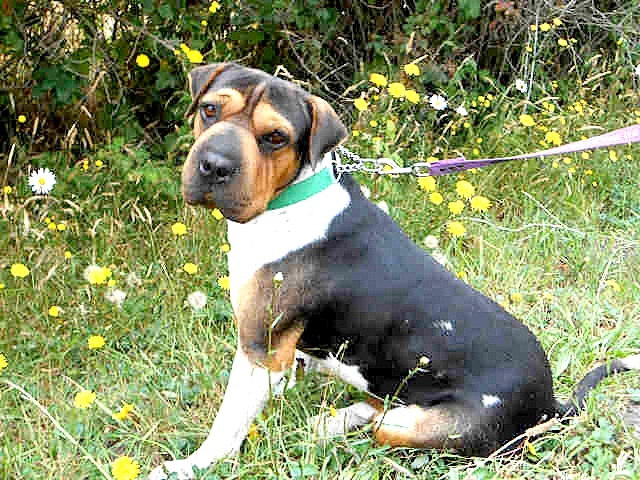 Dutch is an easy dog; he walks well on a loose leash, gets along great with other dogs, and is both gentle and playful. Dutch is very affectionate and loves petting and attention. That big nose of his is velvety soft and just begs to be petted!” He is microchipped and is up to date on his vaccinations. His ID number is A063969. For more information about Betsy or Dutch, call the Humboldt County Sheriff’s Animal Shelter at (707) 840-9132. If you know of an animal that you would like to see displayed in this column, e-mail Helen at helen@arcataeye.com. 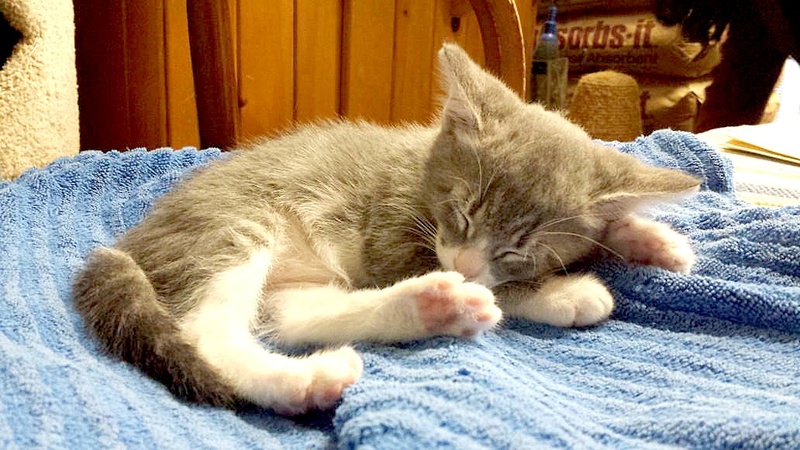 Cora is a light grey tabby female who is approximately nine weeks old. She is super affectionate and loves to cuddle. How can you resist her sweet face? Cora came to us in a litter of three; her sister Clarisse has been adopted, but her brother Clive is also still up for adoption. Clive looks very similar to Cora, although their tabby stripes have a slightly different pattern. Come visit these adorable siblings at Companion Animal Foundation’s adoption room Monday to Saturday 10 a.m. to 4 p.m. For more information on adopting, please visit cafanimals.org or call (707)826-PETS(7387). Companion Animals is generously sponsored by Humboldt Pet Supply. This entry was posted on Wednesday, July 31st, 2013 at 2:16 pm	and is filed under Animals. You can follow any responses to this entry through the RSS 2.0 feed.